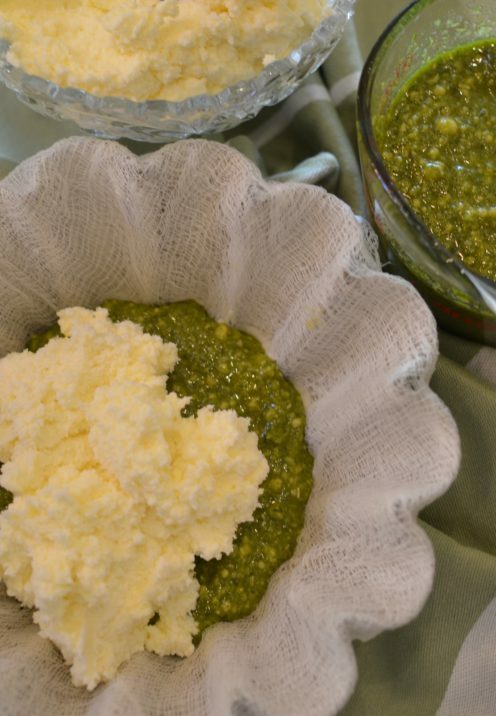 In a recent post entitled Easy Yet Elegant Holiday Snacks I showed you how to make this Cream Cheese and Pesto Christmas Mold as part of a larger blog post. It didn’t include a printable recipe so today I thought I’d reintroduce it as a stand-alone blog post with a printable recipe that will live in my “Cook” category on the blog. Find a vessel that will accommodate 4 cups to use as your mold. I used a fluted metal brioche pan. A clean terra cotta flower pot also works well. 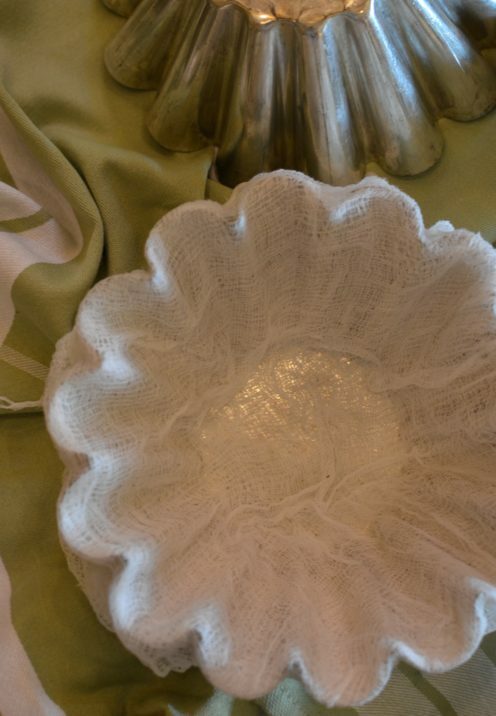 Cut a double layer of cheesecloth to fit your mold, leaving some excess to drape over the sides. Wet the cheesecloth, then wring it dry. Line your mold as smoothly as possible, draping the excess over the sides of the mold. Allow the butter and cream cheese to come to room temperature. Add to the bowl of your standing mixer and beat until smooth and well blended. 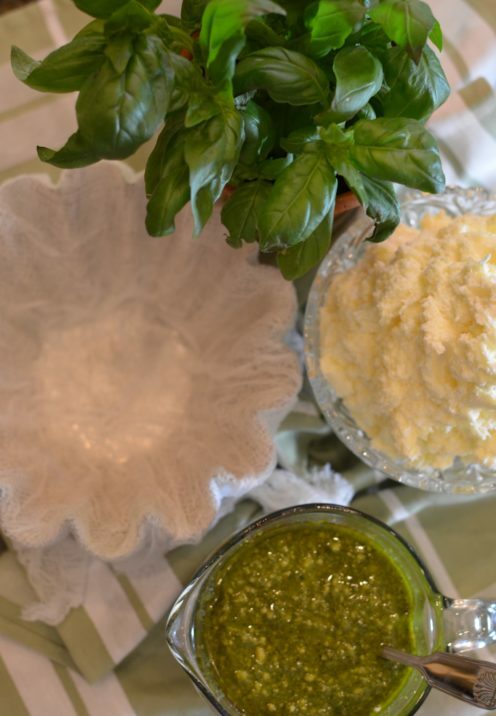 Now it’s time to assemble your Cream Cheese & Pesto Christmas Mold. Depending on the width of your mold you can have as many layers as you wish, but you will start and end with a layer of cream cheese. Carefully spoon the cheese mixture into the bottom of the mold, pressing it delicately and carefully into the mold using the back of a spoon. Next spoon on a layer of Pesto. 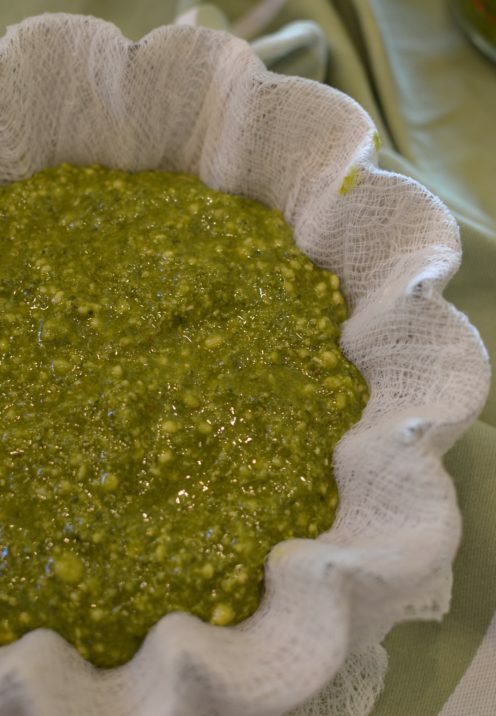 If I have time I’ll make my own Pesto, however, if I’m short on time prepared Pesto is a great, easy alternative. My favorite prepared Pesto is from Costco. 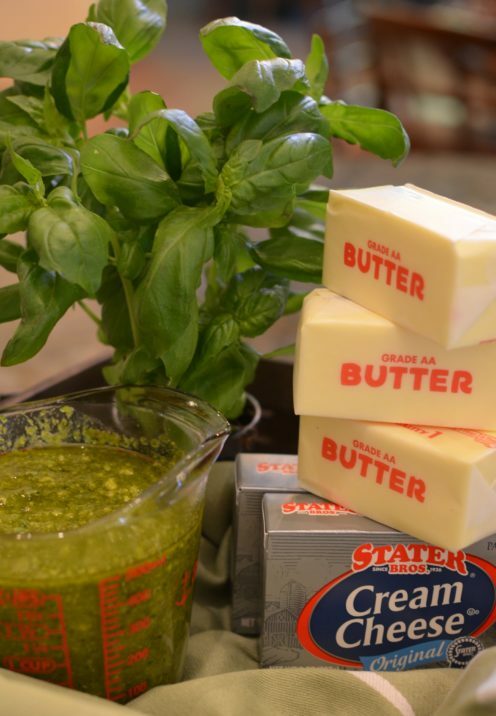 Add another layer of cream cheese, then repeat with a layer of Pesto and so on until you have used up your ingredients. The number of layers will depend on the width of the mold you use. Keep in mind however, that you should always start and end with cream cheese. After you have completed the layering use a spoon to gently press down on the final layer. 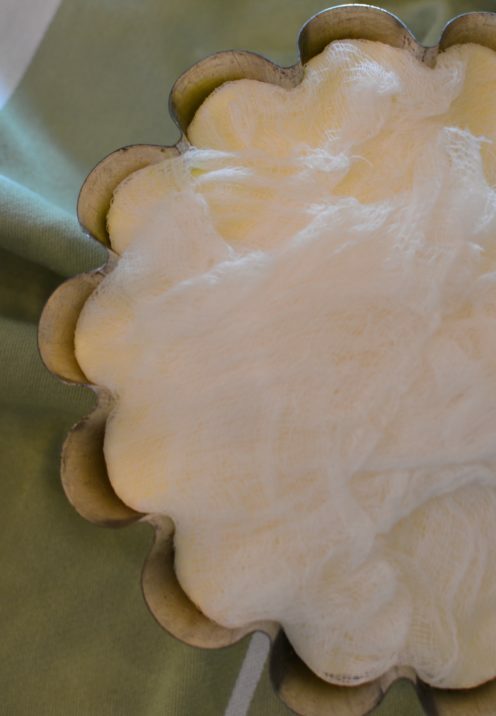 Fold the excess cheesecloth over the top. Refrigerate for at least 2 hours. You can also cover the mold with plastic wrap and refrigerate it up to 5 days. This is a perfect make-ahead snack. 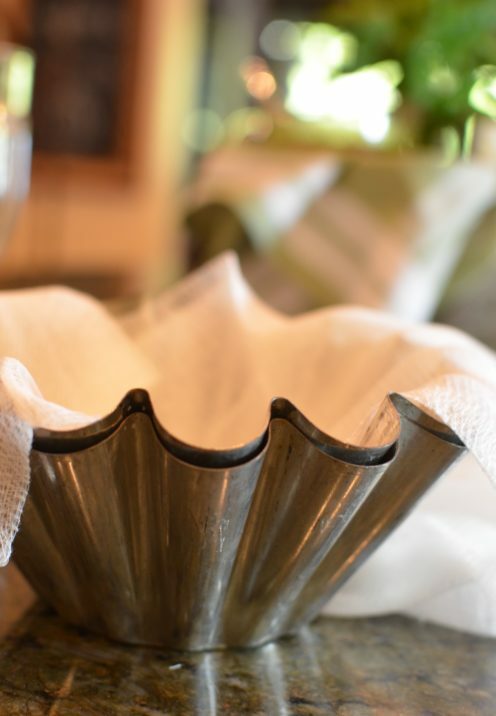 When you’re ready to serve your Cream Cheese & Pesto Christmas Mold fold back the cheesecloth from the top of the mold and invert it onto your serving dish. Then carefully peel back the cheesecloth. Top with some fresh basil leaves. Serve with your favorite crackers. 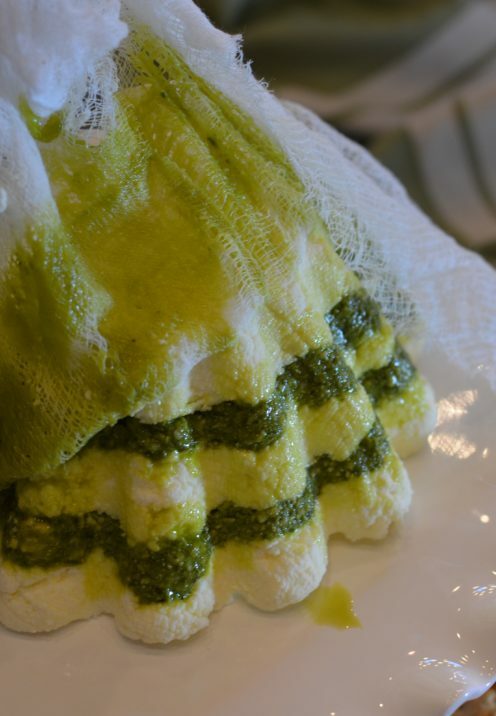 Thin slices of French Bread are also perfect with this Cream Cheese and Pesto Christmas Mold. 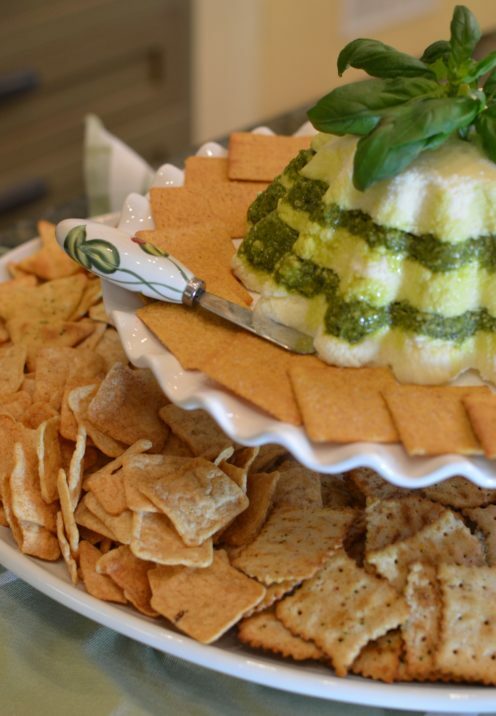 This is a great recipe for serving a crowd, perfect for a large party. If I have leftovers I form the remaining amount into a ball, then I roll the ball in minced fresh basil and voila, I have an appetizer for another day! This is a perfect make-ahead appetizer. You cover the mold with plastic wrap and refrigerate it up to 5 days. Find a vessel that will accommodate 4 cups to use as your mold. I used a fluted metal brioche pan. A clean terra cotta flower pot also works well. 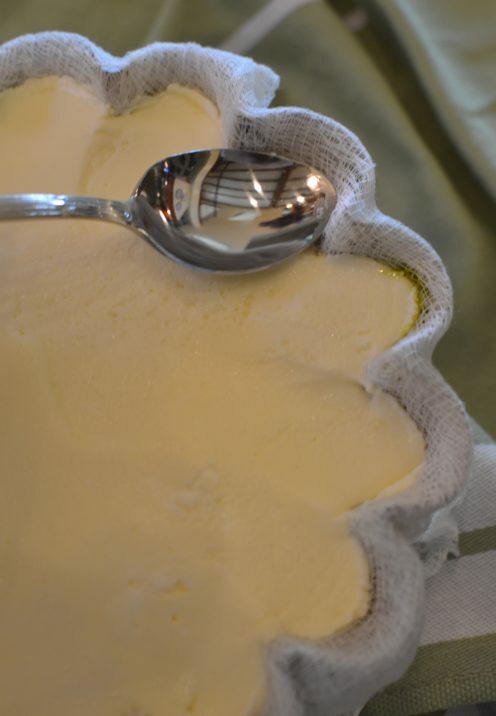 Cut a double layer of cheesecloth to fit your mold, leaving some excess to drape over the sides. Wet the cheesecloth, then wring it dry. Line your mold as smoothly as possible, draping the excess over the sides of the mold. Allow the butter and cream cheese to come to room temperature. 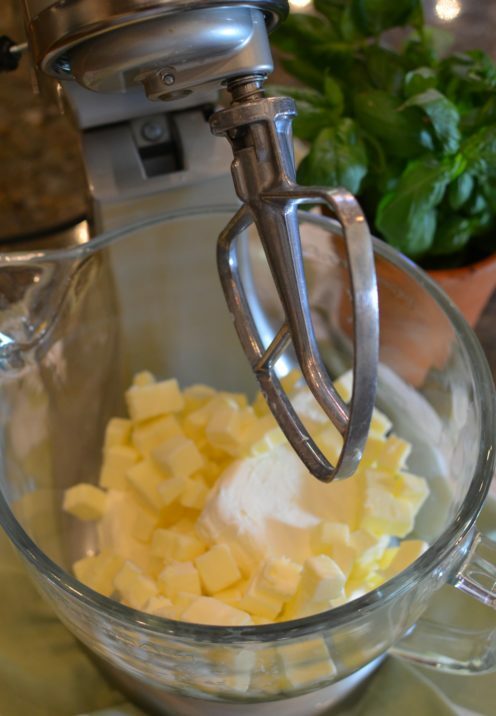 Add to the bowl of your standing mixer and beat until smooth and well blended. 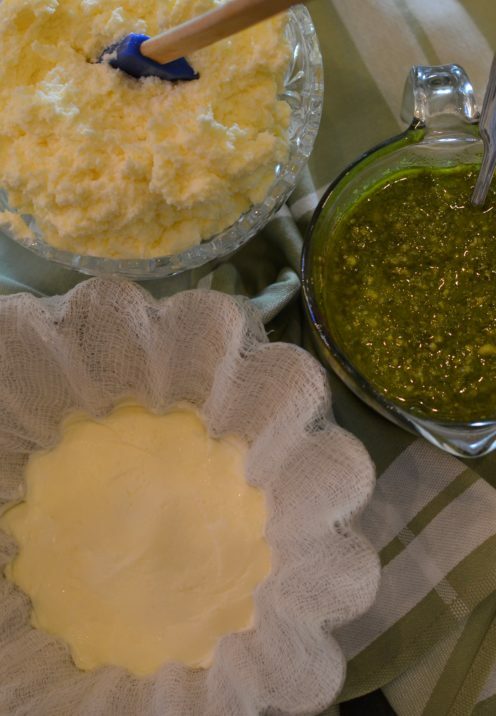 Now it’s time to assemble your Cream Cheese & Pesto Christmas Mold. Depending on the width of your mold you can have as many layers as you wish, but you will start and end with a layer of cream cheese. Next spoon on a layer of Pesto. 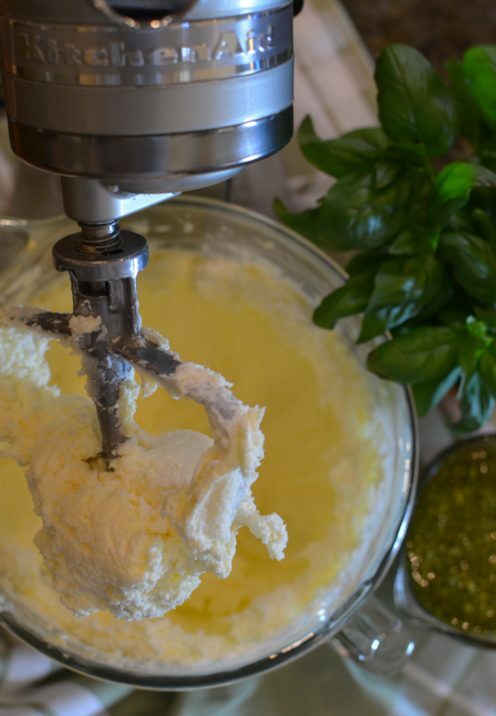 Add another layer of cream cheese, then repeat with a layer of Pesto and so on until you have used up your ingredients. The number of layers will depend on the width of the mold you use. Keep in mind however, that you should always start and end with cream cheese. 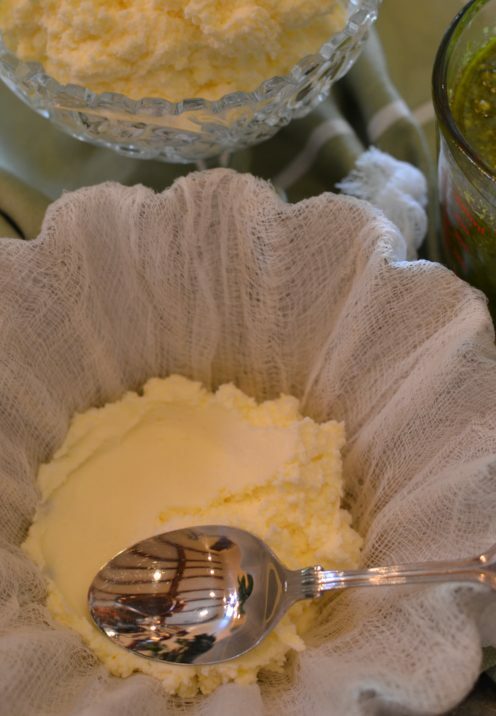 Fold the excess cheesecloth over the top. Refrigerate for at least 2 hours. 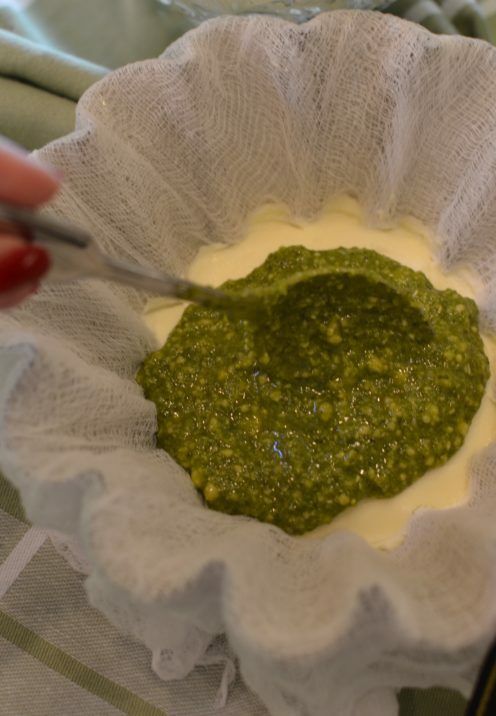 When you’re ready to serve your Cream Cheese & Pesto Christmas Mold fold back the cheesecloth from the top of the mold and invert it onto your serving dish. Then carefully peel back the cheesecloth. Top with some fresh basil leaves. Serve with your favorite crackers. Thin slices of French Bread are also a perfect accompaniment. If I have time I’ll make my own Pesto, however, if I’m short on time prepared Pesto is a great, easy alternative. My favorite prepared Pesto is from Costco.